On day dos of OSL, comfort was once again key. I'm usually one to mix up the outfits - one day, I'll keep it casual with jeans, and the next day I'll let it flow with a floor length maxi. This year, I kept it easy with jeans and sneaks both days in a row, but made sure to jazz up my looks with some fun statement pieces. 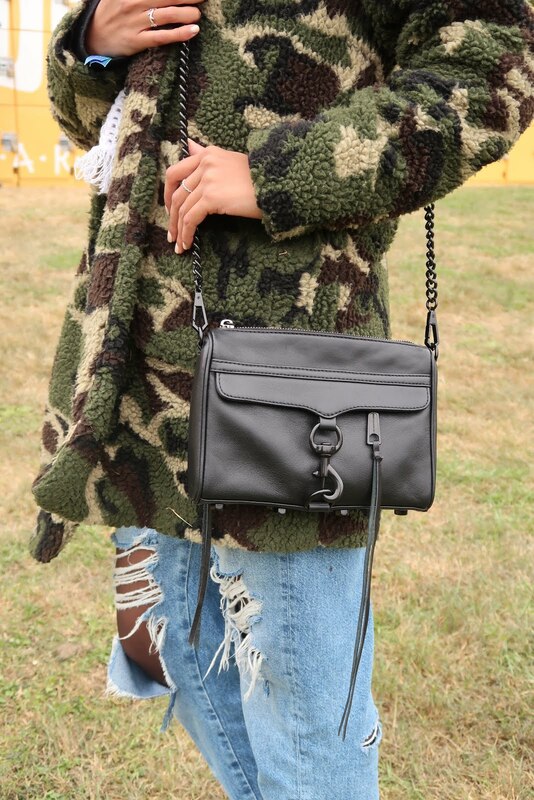 See the breakdown of my outfit, including which Rebeca Minkoff pieces I styled for this look, after the jump! I almost never wear white to festivals because I am super accident-prone, thanks to all of my snacks and beverages. But, as soon as I saw this piece from Rebecca Minkoff, I knew I had to make it work. Plus, it was the perfect top for a San Francisco festival - short-sleeved to keep me cool after dancing, yet, thick enough to keep me warm despite the fog. I loved all of the crochet detail, too! 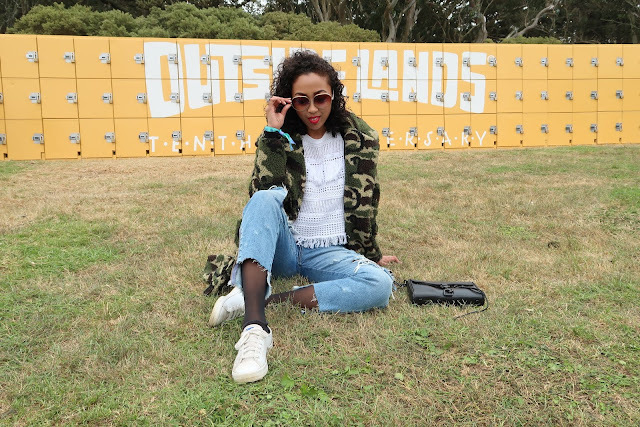 Because Outside Lands is known to be cold, for this outfit, I layered my distressed denim with some sheer tights - it was a great call. Due to all of my dancing, my ripped jeans, well, ripped some more. If it wasn't for my tights, I would have been a popsicle for sure. I also rocked my oversized camo jacket, which kept me warm all night long. I finished off my look with my RM Mini Mac, which carried all of my essentials perfectly. Another festival in the books. 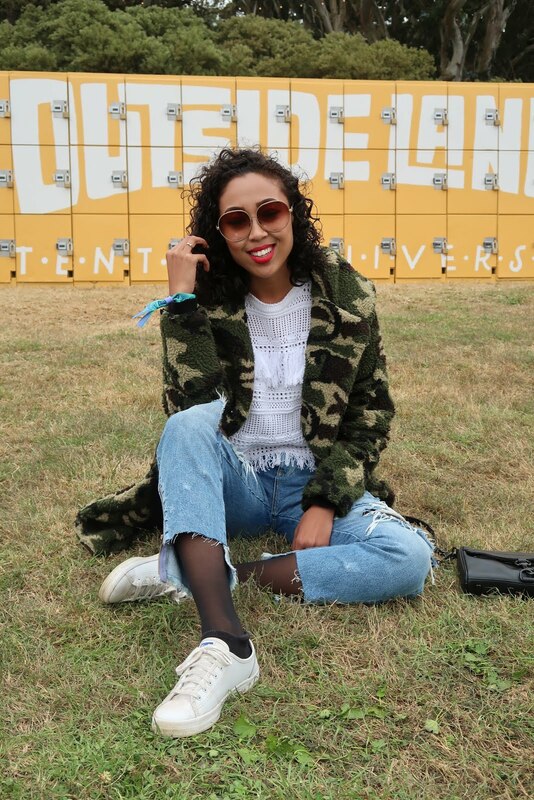 ICYMI, you can see my OSL day 1 outfit, here! Special thanks to Rebecca Minkoff for keeping this SF girl fitted! Girl, love your outfit! the combination is cool. I'm out here discovering bloggers, I'm a new blogger, I create lookbooks and I'd appreciate your support.